After watching Surf’s Up 2: Wavemania, I feel like I’ve seen everything. It’s one of those rare movies where it’s almost hard to believe it actually exists. Not because of any unbelievably exceptional or poor quality, but – like Digimon: The Movie – it’s hard to grasp how baffling the concept behind it is. Surf’s Up 2: Wavemania is a 2017 straight-to-video sequel to 2007’s Surf’s Up. Now, there have been many straight-to-video sequels to popular animated movies in the past, and they all serve the same purpose: to make a quick buck. Disney tainted much of their beloved 90s features with home video exclusive sequels, and other studios followed suit. Disappointing cash-grabs though they may be, at least it makes sense for a cash-grab sequel to be rushed out to make that quick buck (hence the term “cash-grab”). But Surf’s Up 2 arrives a decade after the original which, while a good movie, wasn’t exactly the biggest animated blockbuster out there. So if this straight-to-video affair were going to happen, it seems well overdue. 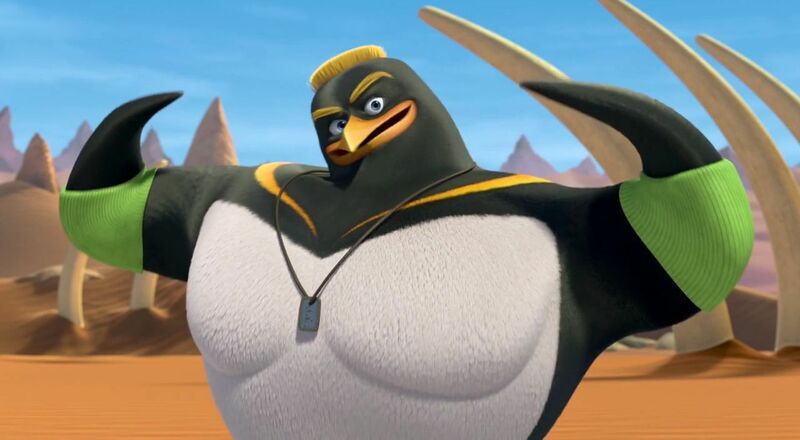 Things get all the weirder, however, because while this is still a feature from Sony Pictures Animation (creators of the original film), it is also a joint-venture with WWE studios, and features new characters voiced by WWE wrestlers and personalities. 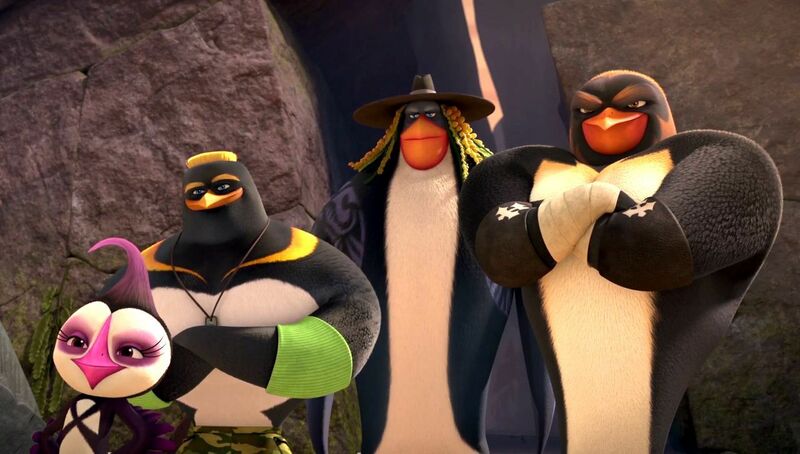 So to review all of this: Surf’s Up 2 is a straight-to-video sequel to a decently successful movie that was released a decade after said original, and features WWE wrestlers as animated characters. Again, it’s hard to believe such a thing actually exists. While I’m not about to say Surf’s Up 2: Wavemania is anywhere near as good as the original, I will admit that it could be a whole hell of a lot worse, especially for a straight-to-video sequel. Though perhaps I’m just so giddy in amazement at the very fact that Surf’s Up 2: Wavemania is an actual thing that I’m seeing it a bit rose-tinted. Either way, Surf’s Up 2 isn’t what I would call a good movie, but I’ve seen much, much worse animated features. So I guess we can file it under the “guilty pleasures” category. 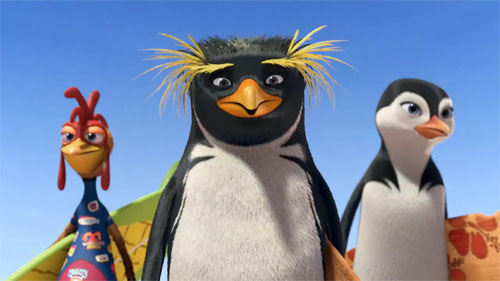 Anyway, Surf’s Up 2: Wavemania continues the story of surfing penguin Cody Maverick (Jeremy Shada, replacing Shia Labeouf, whom I presume was too busy yelling at walls). Cody is the current subject of an after-they-were-famous-style documentary, which showcases how he has gone on to work for a surfing school on Pen Gu Island, whereas his best friend Chicken Joe (Jon Heder) went on to fame and fortune after winning the Big Z Memorial surfing tournament (this serves as a nice way to continue the “mockumentary” style of the original film). Cody is feeling down, wondering what his life might have been like had he won the Big Z Memorial. But Cody gets another shot at fame when a quintet of legendary surfers known as The Hang Five show up on Pen Gu island looking for proteges. The Hang Five consist of J.C. (John Cena), a muscle-bound penguin, Hunter (Paule “Triple H” Levesque), a hard-edged penguin, Undertaker (Mark “The Undertaker” Calaway) a zombie-like penguin, Paige (Sara-Jade “Paige” Bevis), a sassy puffin, and Mr. McMahon (WWE chairman Vince McMahon), an otter who serves as The Hang Five’s leader. The story goes that Mr. McMahon plans to retire from surfing, and the Hang Five will need a new member. After hearing about the great surfers that come from Pen Gu Island from Big Z (the character’s only real mention in the film as I presume Jeff Bridges was out of the budget), the Hang Five head to the island looking for a potential replacement. So four of the Hang Five members select one of the main characters from the first film to be their apprentices in hopes of finding a new fifth member once Mr. McMahon calls it quits. J.C. selects Cody, while the Undertaker picks Chicken Joe. 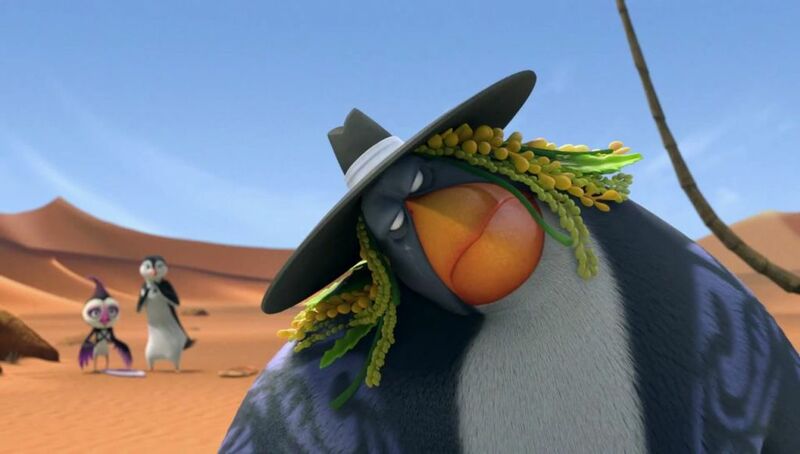 Meanwhile, Paige selects Lani (Melissa Sturm) – the level-headed female penguin from the original – as her protege. Finally, Hunter chooses to mentor Tank (Diedrich Bader), the buffoonish antagonist from the first film. The group then heads out to find a legendary surf spot known only as “The Trenches” to see if the new recruits can handle the dangerous surf style of the Hang Five, and also to give Mr. McMahon one last surfing adventure. To be honest, I’m actually a bit surprised there’s as much of a plot as there is, and that they actually came up with reason for the WWE personalities to be included in the story, instead of being there solely though contractual obligation (though a seagull voiced by WWE commentator Michael Cole just kind of shows up for the hell of it). And I don’t know if it’s because I’m a wrestling fan, or because I’ve managed to see this film for what it is, but I actually liked the voice work. Jeremy Shada is a solid choice as the new voice for Cody Maverick, while Jon Heder and Diedrich Bader still bring the same humor they brought to the original. And the WWE voices, while maybe a little distracting at times, can actually be kind of fun (so sue me). Hearing Vince McMahon’s voice coming out of a surfing otter is just too ridiculous not to enjoy to some degree. And having the Undertaker voice a penguin-ified parody of the character he’s portrayed for over twenty-five years hits a few good comedic moments. Less appreciated, however, are the film’s pacing and more juvenile humor when compared to the first film. While the original Surf’s Up had an appropriately laid-back, relaxed tone to it, Surf’s Up 2 instead sends our heroes in a frantic adventure with big action set pieces including hang-gliding over lava and traversing a boobytrap-filled tomb. And while some of the humor of the film works, other times the film employs more bathroom humor and slapstick, which feels pretty removed from the nature of the original film. On the plus side, the film is pretty well animated, especially (once again) considering it’s a straight-to-video feature. It may not be anything to write home about, and not as visually captivating as the original, but the animation has a nice, colorful look to it. Surf’s Up 2 is a fun film to look at, if anything. Look, I don’t know what else to say. I’m still a bit dumbfounded at this movie’s existence, even as I’m writing about it. Yes, it is a cash-grab, direct-to-video sequel, and not all of the wrestling stuff works (we hear the Undertaker’s theme music on not one, but two different occasions. The first of which is for a gag, which is fine, but the second instance is during a more dramatic moment, which is unintentionally hilarious). But all things considered, it’s far from the worst direct-to-video animated sequel I’ve seen. So again, I can see this becoming something of a guilty pleasure. It doesn’t live up to the original Surf’s Up. But, y’know, it is what it is. And considering what it is, it could have been a lot worse. I think I’ll be the first to say it, there was a Surfs Up 2? Hahaha! Yep, just came out in January.